The Office of the National Coordinator for Health Information Technology is shifting away from its focus on meaningful use and toward one centered around data mobility and interoperability as it implements the 21st Century Cures Act, according to the head of the agency. 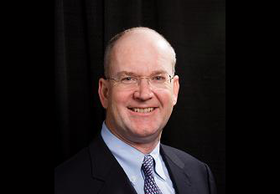 The ONC wants to encourage the development of technology and definitions that give patients control of their own data and allow providers to analyze data, Dr. Donald Rucker, the national coordinator for health IT, told a roomful of Allscripts users at the Allscripts Client Experience conference in Chicago on Wednesday. The agency is also figuring out what open application programming interfaces actually entail. "We have to think about consumer sovereignty and consumer control of healthcare," he said. Consumers haven't had complete control over their own healthcare since 1965, he said. "We know how to do pay-for-value as consumers when we're spending our own money," he added. "If there's anything Americans are good at, it's knowing how to shop." That's becoming an increasingly important part of healthcare, as high-deductible health plans become more common. But large payers still account for 60% of healthcare spending, and the ability to shop has been hindered lately by the mergers of U.S. healthcare systems. It's important, but difficult, to arm payers with data to analyze how valuable various providers are, Rucker said. That project is essentially a larger-scale version of the ONC's first aim in responding to 21st Century Cures: Give patients the power to access their own health data. "Can we, as individual consumers, get our electronic medical record from our provider on a smartphone? Can we get our data individually and control it?" Though there are plenty of patient portals now, those can be "daunting," Rucker said, especially because as providers accumulate, so do the portals. The implication is that it's important for patients to access their own information not just for their own sake but for the sake of interoperability and more frictionless movement of data. "It's essential to enable data to follow the patient, to assist providers in the coordination of care, and to contribute data to public health initiatives, registries, and research to enable a learning health system," said Sasha TerMaat, chair of the Electronic Health Records Association executive committee. One way to get data to move is open APIs, which the 21st Century Cures Act mandates by tasking EHR vendors to open up patient data "without special effort, through the use of application programming interfaces." Rucker emphasized the distinction—without quite naming what it is—between open APIs for vendors and open APIs for providers. "We're hard at work at defining those," he said. One difference is how the APIs are implemented: Vendors must allow for the APIs technologically, in their products, and providers must actually take advantage of the APIs. "There's no benefit to me as a provider," said Methodist Health System CIO Pamela McNutt of open APIs. "Our problem is data mapping, data standards and patient matching," she said. "Open APIs is just another means to transport data, but it doesn't solve all the other issues." Though Rucker did not explicitly compare the 21st Century Cures Act to recent attempts to repeal and replace the Affordable Care Act, he did lead off his talk by pointing out how overwhelming the support for the 21st Century Cures Act was. The Act passed with 392 votes in the House and 95 votes in the Senate. "That's what we would call in the clinical world a 'reportable event,'" he said with a smile, eliciting chuckles from the audience. Check out our August 21 issue for a more in-depth Q&A with Rucker.